Jackie Maguire wrote in asking for a photograph that had been taken of herself and some other girls at the Garrison Theatre, Park Hall Camp when she was picked as a contestant for Carnival Queen for 1958. We found the pictures which are shown below, and she replied with some history about herself and her husband. “A group of us were at the Garrison Dance when an older man and woman, total strangers, started wandering around the dance floor with blue sashes. The man came up to me, presented me with a sash and told me I had been chosen as a Carnival Princess. I was quite shocked as, not being a local girl, I hadn’t heard about the carnival. 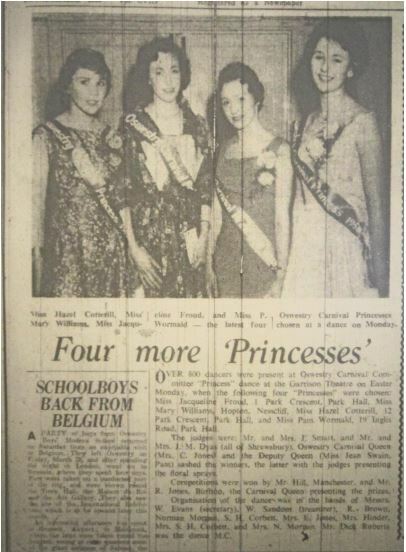 Apparently, the couple went to the Dances for a couple of weeks looking for Carnival Princesses. From 1956 to 1958 I actually lived in married quarters at Park Hall army camp where my father was a Royal Artillery Captain, quarter master of 68 regiment. 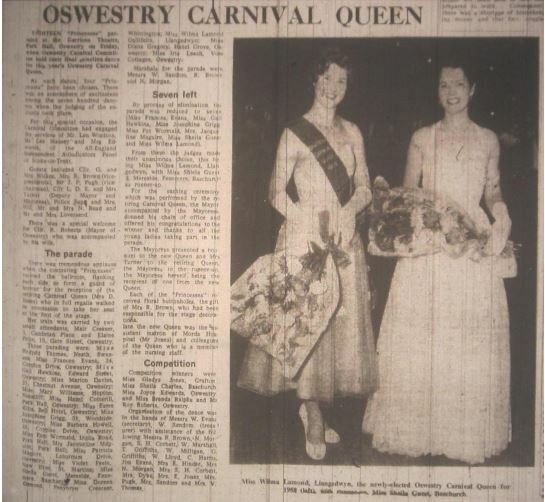 I was 16 when we moved to Oswestry from Lincoln. My first job was as a shorthand typist at Ellis’s Garage on Salop Road, earning the grand total of three pounds ten shillings a week. I was allowed to go to the Plaza Ballroom with my friends on Saturday nights as they did not serve alcohol, only tea and biscuits in the interval. 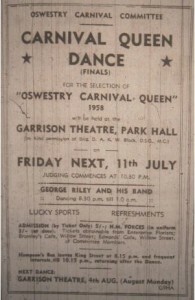 They had a really good dance band, some of whom were members of the Royal Artillery band, who were based at Park Hall. The Garrison Theatre also held a Saturday dance, but I wasn’t allowed to go there until I was 18. 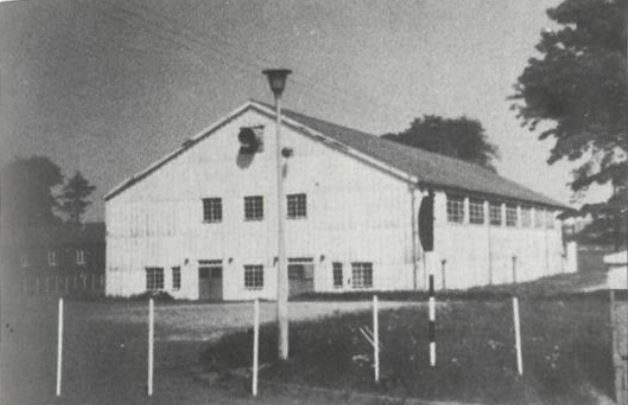 Park Hall Camp was home to four RA training regiments, 2 national service and two regular army. As I’m sure you know, all men had to do 2 years national service in the army but could be deferred until they had completed a course of study or an apprenticeship. As a consequence, we had an assortment of actors, writers, musicians, football players, a barrister and even a Lord somebody or other. With such a large pool of talent they put on some great concerts, musicals and revues. I met my husband, James Maguire an apprentice carpenter/joiner with Fred Davis’s building firm. 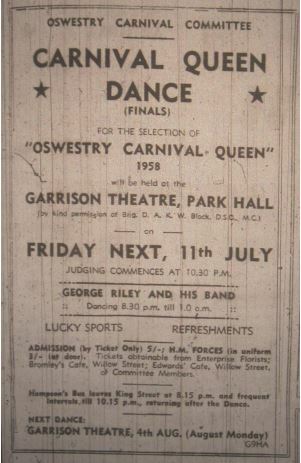 He and his family lived in Oswestry for most of his childhood after the family was bombed out of their home in Liverpool 3 times during the war. We married in Oswestry Register Office on April 14th, 1958. Jim had joined the RAF by this time and since then we have travelled to many countries, eventually settling here in Adelaide, South Australia.